Beautifully engraved certificate from the Twenty-Third Street Railway issued in 1912. 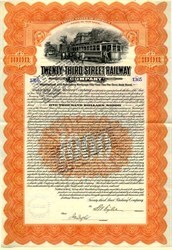 This historic document was printed by American Bank Note Company and has an ornate border around it with a vignette of an streetcar with passengers. This item has the signatures of the Company's President and Secretary and is over 94 years old. 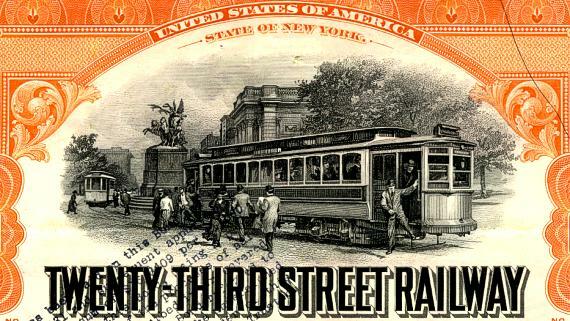 The Twenty-Third Street Railway was a street railway in Manhattan, New York City, USA. It was originally operated as horse cars and later electric traction. Its trackage ran simply along 23rd Street between 13th Avenue at the Hudson River and the East River east of Avenue A, with a depot on the north side of 23rd Street between 13th and 11th Avenues. The railway leased the Bleecker Street and Fulton Ferry Railroad, which went from 14th Street on the Hudson River to Fulton Ferry on the East River; both were leased by larger companies. History The company was chartered on January 29, 1872. It leased the Bleecker Street and Fulton Ferry Railroad on January 10, 1876, and was leased to the Houston, West Street and Pavonia Ferry Railroad on April 25, 1893, which was consolidated into the Metropolitan Street Railway in December 1893. The Metropolitan Street Railway was leased by the Interurban Street Railway on April 1, 1902, which changed its name to the New York City Railway on February 10, 1904. That company went bankrupt in 1908, and the Metropolitan Street Railway separated on July 31. History from Wikipedia and Old Company Research.